Full Pull Productions, Inc. is a multi-faceted motorsports promotion and production company that caters primarily to clients in the county fair industry and also to speedway venues. The company was incorporated in 1987 by Richard (Rick) Feicht and has become the largest private producer and promoter of high-quality tractor and truck pulling events in the United States. Rick Feicht is the President and CEO of the corporation while Patty Feicht is the Secretary and Treasurer of Full Pull Productions, Inc. The Director of Operations/Vice President is R.J. Feicht of St. Petersburg, Pennsylvania, who is also the son of the President/CEO. Full Pull Productions has a loyal workforce of some thirty men and women who comprise the best production team in the business of tractor and truck pulling. In 2017 a milestone was reached with the marking of the 30th Anniversary of the incorporation and operation of Full Pull Productions, Inc. The offices of Full Pull Productions, Inc. are located in Jamestown in Mercer County, Pennsylvania. This location is only six miles east of the Ohio line and is about 50 miles south of Erie and 90 miles north of Pittsburgh, Pennsylvania. Full Pull Productions, Inc. is the parent company of the Big Rigs Pulling Series, the oldest series of events that are dedicated to the over-the-road trucking industry. The name and title ‘Big Rigs Pulling Series’ is a certified trademark associated with modified semi truck pulling in the United States and can only be used at those pulling events that are specifically sanctioned by Full Pull Productions, Inc. In recent years, Full Pull has paid out nearly $45,000.00 in end-of-season point fund money and contingency money to the pullers in its various classes of competition. The major sponsor of Full Pull Productions has been the Central Petroleum Company of Cleveland, Ohio. Cen-Pe-Co Lubricants has provided much needed sponsorship capital that has allowed for extended point fund pay-outs and contingency payments to pullers that compete with Full Pull Productions, Inc.
For 2019 Full Pull Productions, Inc. will work with nearly fifty different County and State Fairs and other genres of Speedway venue promoters. The common goal is to bring the highest possible level Motorsport action and competition to the spectator while keeping the costs of this entertainment at a level that is attainable to our clients. 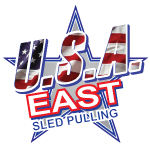 All upcoming events for 2019 will be sanctioned through the USA-EAST SLED PULLING group that has been established for the sole purpose of providing sanctioning for Full Pull Productions’ pulling events. USA-EAST is a wholly owned subsidiary of Full Pull Productions, Inc. and is located in St. Petersburg, Pennsylvania in Clarion County.